Over the coming months we will be publishing a series of articles providing an introduction to navigating in a mountain environment. Although this will primarily focus on the use of UK maps, readers from overseas will hopefully get a lot from the sections covering general aspects such as estimation of distance travelled, the use of a compass and GPS. Written by Giles Thurston, a qualified International Mountain Leader with over twenty years of experience of navigating in a mountain environment, including working as an outdoor instructor teaching navigation. As we publish the articles they will appear on the site and the list above will be updated to link to the article in question. If you would like to see any additional articles on the subject matter then please don’t hesitate to contact us. If you would like to comment on this or any other articles then please make use of the comments section at the end of the article in question. The art of navigation from first stages to GPS. For everyone from the complete novice to the experienced hillwalker. Explanations on the different type of tools available to help in finding your way. Fully illustrated with the author’s own photographs and OS and other mapping. Appendices outlining further practice techniques and useful sources of information. This practical guide will help you get the most out of your map and give you the key skills to using your compass. It’s then down to you. Practice will make perfect, and with that will come the freedom and confidence to enjoy our hills and mountains. This practical guide explains how to get the best from your GPS, and takes you through GPS navigation in a clear and structured way. 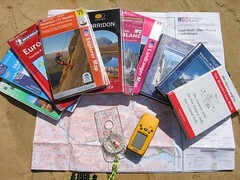 It summarises how to navigate with a map and compass. The guide also looks at digital mapping, and how GPSs and mapping software can be used positively together.